Does your property have excessive runoff from rainwater or melting snow? All that liquid can not only make your yard a soupy mess, it can even threaten the structural stability of your home. Digging a swale in your yard will reduce or eliminate this serious problem. A swale will also help conserve water and create a lovely, low maintenance landscape for your home. What is a swale and why build one on your property? A swale usually is designed to follow the natural contours of the surrounding landscape, often with a berm (a human-made ridge of earth, which may be sown with plantings for stability) along the lower edge. A driveway swale flanks your drive on one or both sides, in order to keep runoff from flowing into your garage or your home. A swale may be combined with underground piping to handle your roof runoff. The standard swale dimensions generally range from 6-18 inches deep and 8-24 inches wide, depending on the volume of water you are dealing with. Avoid storm water pooling around your house and prevent damage to the foundation. Help hold off flooding of your house, garage, and yard – and perhaps your neighbor’s property. Reduce soil erosion and loss of high quality top soil. Collect rainwater much more easily than with a barrel or tank system. “Recycle” rainwater to irrigate your garden, for a flourishing low maintenance landscape. Contact a one-call center for clearance before you begin swale construction, or any other home improvement that involves digging. Otherwise, you run the risk of hitting underground utility pipes or cables ... and the hefty fine that can result. In addition, check with the building authority in your area to see whether you’ll need a permit for the job. Many local governments have enacted strict laws concerning landscaping work that could possibly affect the groundwater system. Consult a professional landscape contractor to plan and implement your project in the best way. 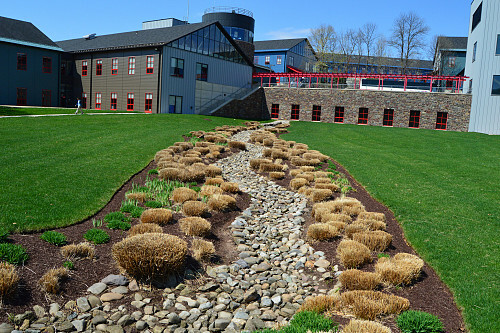 Plan your landscape design to include your swale. Make sure that any new feature you install, such as a fence, will not block the flow of runoff through the swale. The swale does not need to be an unappealing stretch of bare earth. You can seed it with grass, but be sure that your swale’s sloping sides won’t make it too difficult to mow your new patch of lawn. An alternative is to plant it with low care wetland species such as cattails or lovely marsh hibiscus. You might prefer to line the swale with nice-looking pea gravel or river rocks. Besides permitting storm water to infiltrate the soil more efficiently, small stones will give your swale the attractive appearance of a dry creek bed. Finally, permeable pavers are perfect for stabilizing the bottom of a swale which will double as a garden walkway during the dry season.